A fantastically successful launch to the Division of Occupational Psychology (DOP) Diversity and Inclusion at Work group’s research seminar at City University, saw a packed room of students, academics and practitioners all engaging in the ever topical issue of diversity at work. 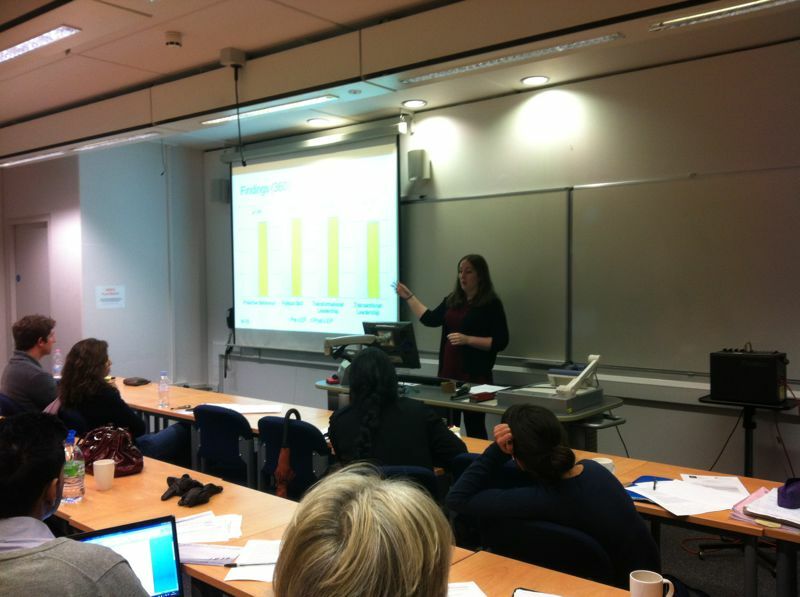 Glow at work were very proud to be presenting, alongside our partner from Kent Business School, Dr Maddy Wyatt. The presentation addressed the results of the positive action intervention; the Leadership Empowerment through Achieving your Potential Programme (LEAP) within the NHS. The theme of inclusion at work is particularly crucial within the NHS, given the demographic context. This context refers to the fact that in London, only 15% of senior managers come from a BME (Black or Ethnic Minority) background, compared to 40% in the general working population. 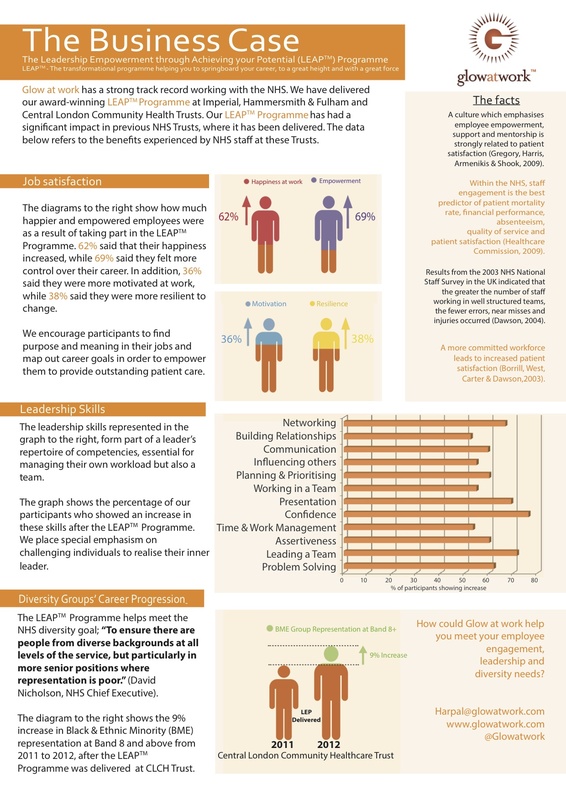 In addition, 20% of NHS organisations had no BME nurses in senior roles (Blackman, 2011). It would seem that an organisation which employs such a large amount of BME groups does not have a very strong representation of such groups at the higher organisational levels. 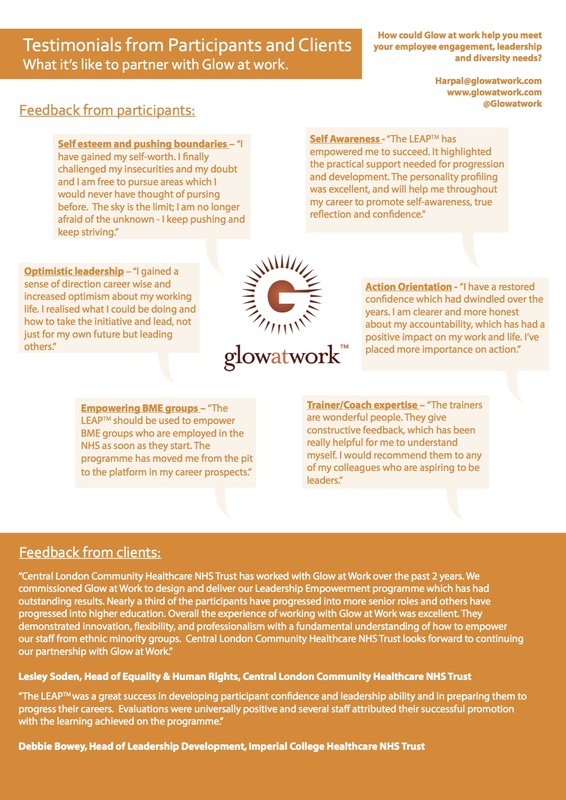 Therefore, Glow at work identified a need to develop such groups via a positive action approach – cue the Leadership Empowerment through Achieving your Potential Programme (LEAP). This term positive action is one which encourages under-represented groups to take up training and development in order to progress their careers. This is distinct to affirmative action – where there is a legislative requirement to hire under-represented groups i.e. a quota, for lack of a better term. This has been controversial in places where it has been implemented, and has been used as a way to redress past discrimination i.e. in South Africa. However, this has led to reduced self-confidence and a perception of being less competent, as well as backlash from other majority group workers because there is a lingering feeling that such individuals haven’t earned their place. This is essentially positive discrimination and hence should not be confused with positive action, as can sometimes be the case. For the number crunchers amongst you, we also found statistically significant results which support these qualitative findings. There were significant increases in career self efficacy (p=0.04), political skill (p=0.02) and career satisfaction (p=0.05). Crucially, others who work with the participants also reported a significant increase in proactive behaviour (p=0.04). These results show that a positive action intervention such as the LEAP, can lead to benefits such as acquisition of career progression tools as well as an improvement in employee attitudes. The exact cause of these positive outcomes however, cannot be as easily pinned down. Was it the mentoring? Was it in fact workshop number one or two? Or maybe it was the application involved in the design? Or perhaps it’s a case of the sum of the trees being greater than the forest i.e. collectively all of the elements amount to a greater benefit than any one part by itself. There is one thing for certain however, that we must follow through on our vision to nationalise this Leadership Empowerment through Achieving your Potential Programme within the NHS in particular, in order to gather more data to show the benefits of positive action. More importantly however, a group of people were genuinely empowered and inspired to move on in their careers as a result of the LEAP. This is a gratifying feeling, and one which without all the metrics and evidence that is required to make a case for positive action and inclusion at work, speaks to the humility and decency within all of us. We’d like to thank the DOP Diversity and Inclusion at Work group for providing a forum for us to share our findings as well as learn so much from others. This is a crucial issue, which will continue to be important as the world becomes more connected and globalisation accelerates. We hope that organisations understand this and that it continues to sit on their strategic agenda, even in times of economic hardship, as it is our duty as a democratic world leading nation to set an example. And that is, as one delegate pointed out during the seminar, to get back to the roots of psychology and to appreciate individuality and treat each person, as an equal but unique personality – the epitome of a meritocracy. We’re proud to say that our transformational Leadership Empowerment through Achieving your Potential Programme (LEAP), which has won a HPMA HR excellence award, has had a significant impact on NHS staff, in Trusts where it has been delivered. Have a look at some of the data that we’ve collected: Happiness at work, Empowerment, Motivation, Resilience, Leadership skills and even Black and Minority Ethnic (BME) representation at management levels have seen a positive increase. We have also managed to collate testimonials from our clients, as well as some of the participants on the LEAP. As can be seen, the combination of expert coaching, psychological insight, personality profiling and time to develop, reflect on and plan one’s future has had an incredible impact. Please get in touch if you have any questions regarding this data. The Glow at work team.